The Central New York Chapter of the National Railway Historical Society (CNYNRHS), based in Syracuse, NY is a 501 ( c )(3) non-profit dedicated to history, preservation and restoration of railroad engines, rolling stock, railroad stations and all items that have been part of railroad history in the Central New York area. Donated to us in 1986 and sitting at the NY State Fairgrounds, our circa 1910 New York Central 19144 red, wood-sided caboose has seriously deteriorated over the years. Deterioration has been so bad that for safety reasons, this popular caboose has not been available for tours by the public. One of approximately six of its kind known to exist today, it is also special because it is believed to have been built in NY and used in CNY for at least some of its history, possibly tying it to former railroad employees and their families of the greater CNY area. Because of limited chapter funds, its restoration has been out of reach, until now. 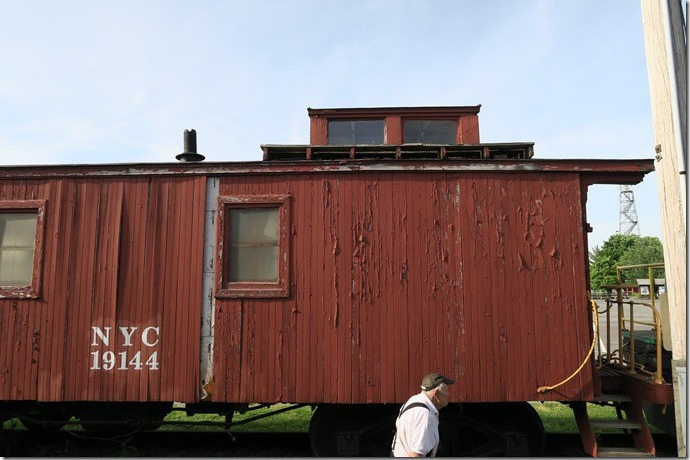 Fortunately, and most gratefully, The Central New York Community Foundation of the Central New York Philanthropy Center here in Syracuse recently awarded CNYNRHS a grant toward the restoration of this historic caboose. Restoration is planned for completion in advance of the NY state Fair when it opens in 2019. 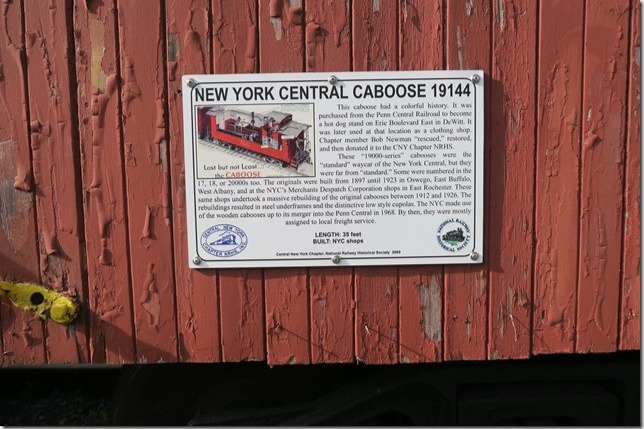 Thanks to the Central New York Community Foundation, fairgoers and other interested groups will be able to tour the caboose and learn more about the railroad history of our CNY communities, helping CNYNRHS to continue to fulfill its mission of railroad history, preservation and restoration. While the grant will enable the structural restoration of the frame, sides and roof of the caboose, our chapter, as our share of the restoration, will be responsible for furnishing the finishing details of the caboose including re-creating the functional interior: furniture, lighting fixtures, tools, the wood stove, toilet, signs, educational details for the public and any other costs over and above the grant. CNYNRHS is looking for cash donations in any amount to help with completion of the restoration. We are also looking for items of the period that could be used in furnishing the caboose, and professional and family stories of railroading in the early 1900s in Central New York. If you love railroad history, and appreciate the tremendous contribution it has made to our area and the nation, please let us know what you can contribute to this project. The volunteer membership of The Chapter is deeply grateful to The Central New York Community Foundation for their support, and recognition of the value of our mission to contribute to the rich railroad historical of CNY, and we hope others will join in that support. For more about the work and efforts of the CNYNRHS, please visit our Website at www.cnynrhs.org . 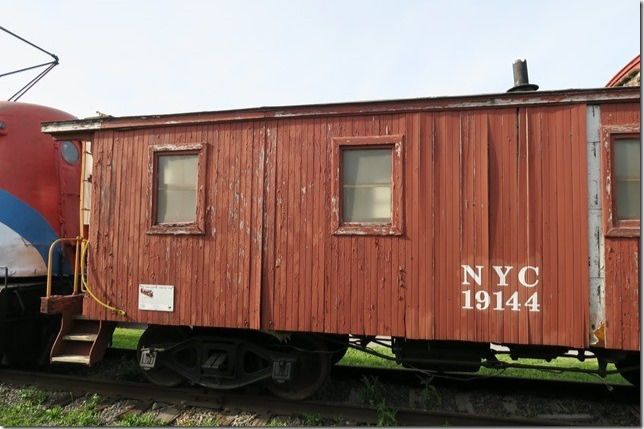 Help us restore our Caboose at the New York State Fairgrounds.